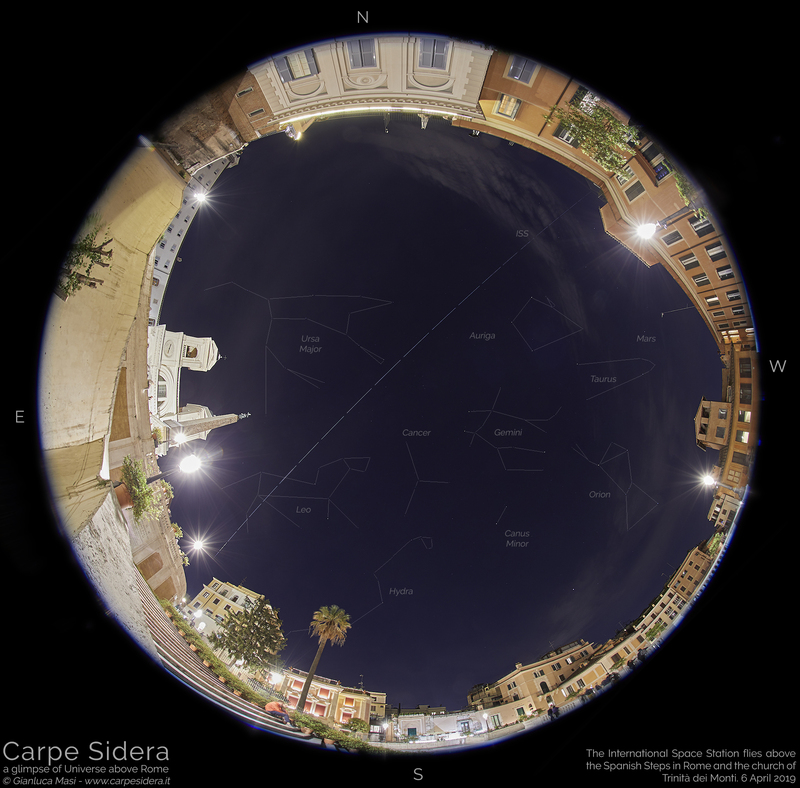 The International Space Station (ISS) made an extremely bright pass above Rome on April 6th, a great opportunity to test a new way to capture and share such an event. Here I’m pleased to show you the results. Imaging the International Space Station (ISS) while it crosses the starry sky is something I’ve been doing a number of times now. As I always say, looking at these passes is funny and exciting, no matter how many times you have seen them. 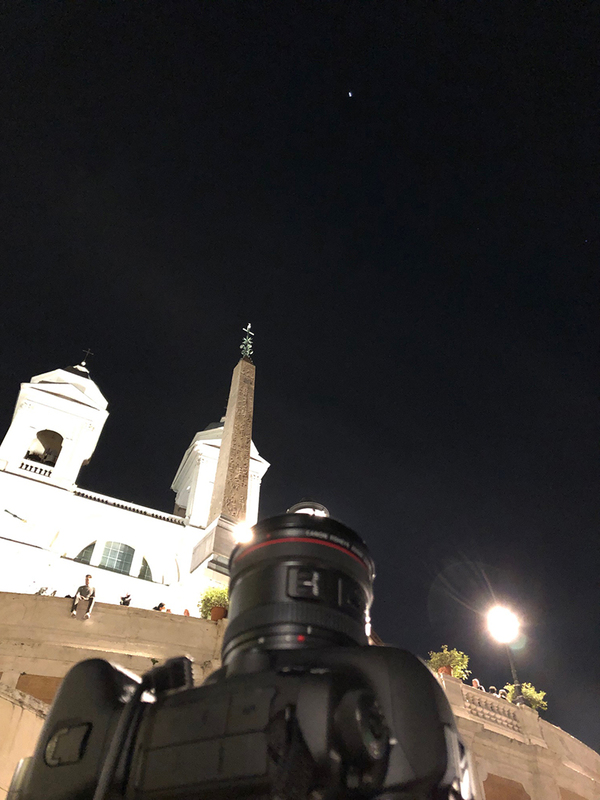 Furthermore, I love sharing my images, especially from Rome, hoping to inspire other people looking up from their cities.I believe this really is the first step to rise the public awareness on the light pollution issue and promote the cultural importance of the night sky and its preservation. I have been thinking a lot about the best techniques to capture the experience of the urban night sky and bring it at its best to the public. What I really want is to properly mix what shines in the sky with the urban elements below. The ISS, with its always different paths across the stars, is a perfect “model” to plan new imaging sessions, every time asking to your creativity something new, something more. It was the ISS to push me to use of a fish-eye lens to capture its entire passes, adding the whole panorama all around me. The first attempt was quite convincing, also looking at the feedback it had. For the very bright pass expected on 6 April I decided to use that technique again, this time from a well known part of Rome. Surely the “Spanish Steps“, a very beautiful stairway climbing from “Piazza di Spagna” to the “Trinità dei Monti” church, are one of those places! The natural slope of the terrain offers the church itself in a prominent position, really standing out in a 180 degrees view from a point of the stairway just below it. This place has been in my mind for quite some time and I decided this spectacular ISS transit was the right event to exploit it. I reached the Spanish Steps about 30 minutes before the ISS transit. I wanted to set up my imaging gear to minimize the impact of the streetlamps there on the images. This is always VERY critical in every fish-eye photography, as they can produce very strong flares and destroy the image. I did the best I could, but some flares were simply impossible to avoid: hopefully I could remove them once post producing the images. I used one of my Canon 5D mIV DSLR bodies and a Canon EF 8-15mm f/4 L USM Fisheye lens, working at 8-mm to provide its 180-deg., circular field of view. All this was installed on a light, portable tripod. A remote controller was also used to automatically take a sequence of images, starting at the time the ISS was expected to rise and ending when it jumped into the Earth’s shadow. The resulting image is above: the ISS shows magnificently, with the entire pass covered. The International Space Station entered the sky from the upper right and moved to the bottom left. For most of the day clouds covered the sky, luckily they moved away almost completely just before the pass. I managed to draw some of the constellations visible during the transit. I must say I’m very happy with these results, as they fit with my expectations and ideas; hopefully, the image above will bring to you the feelings and thrill of my experience there. I’m already looking for another event and another place, so stay tuned!